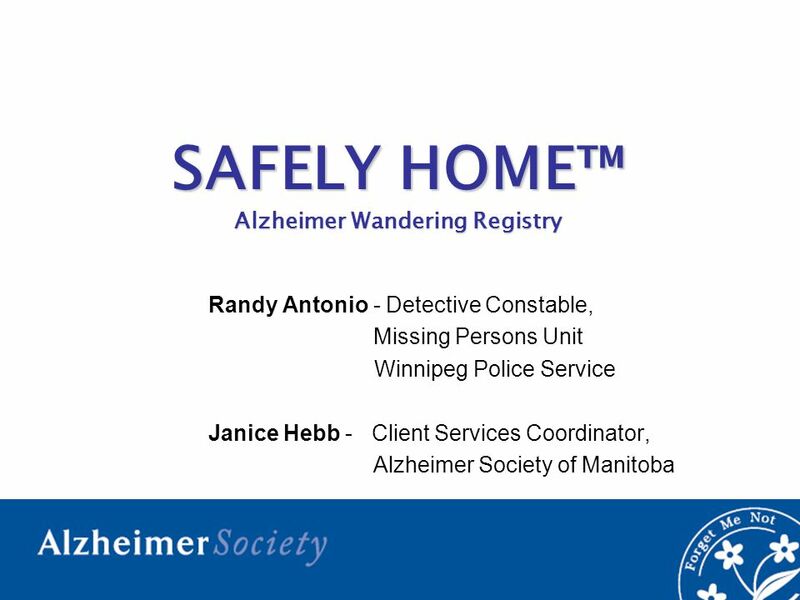 SAFELY HOME™ Alzheimer Wandering Registry Randy Antonio - Detective Constable, Missing Persons Unit Winnipeg Police Service Janice Hebb - Client Services. 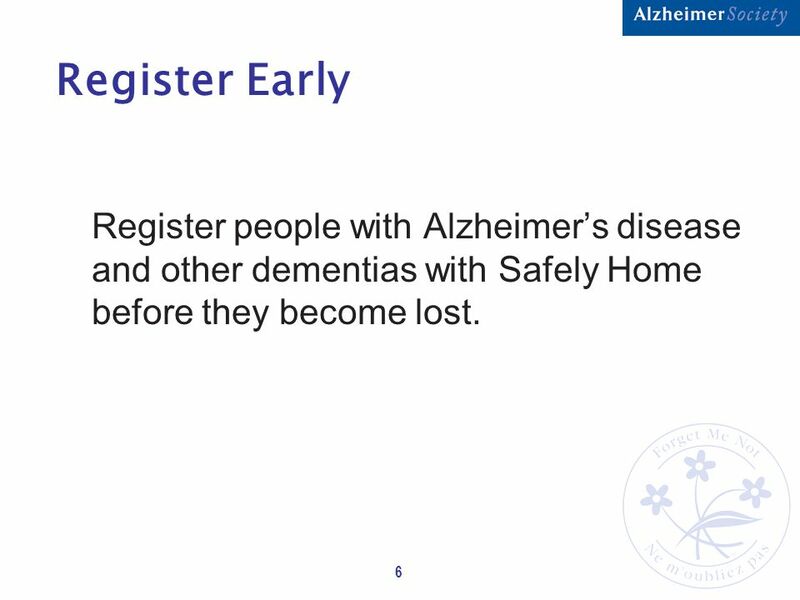 6 6 Register Early Register people with Alzheimer’s disease and other dementias with Safely Home before they become lost. 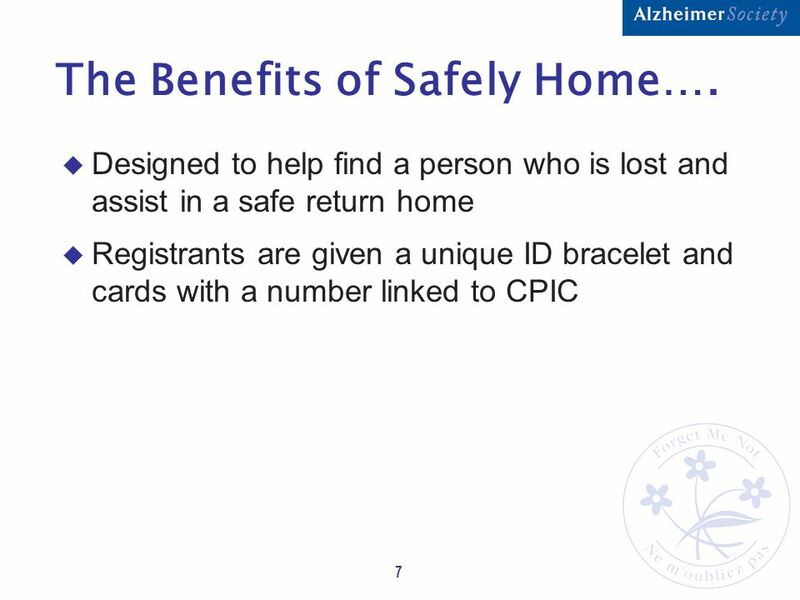 12 12 Safely Home...How Can It Help? 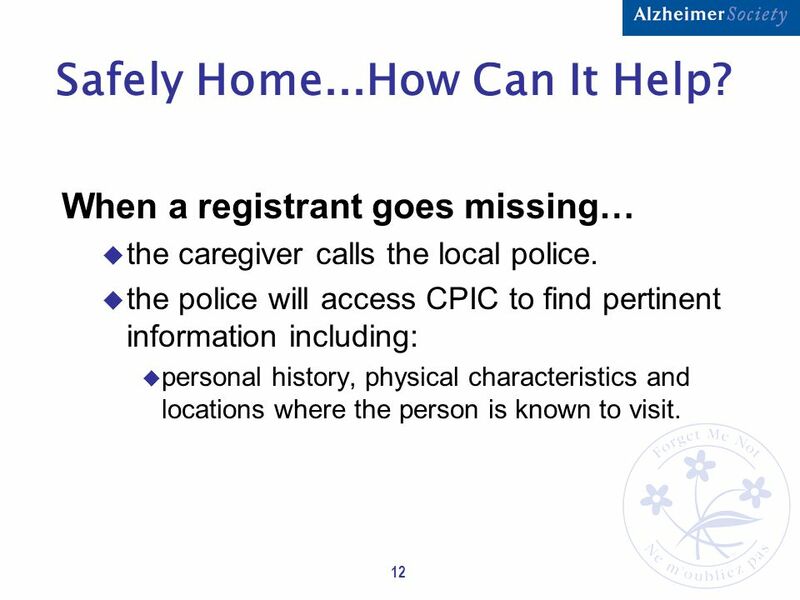 When a registrant goes missing… u the caregiver calls the local police. 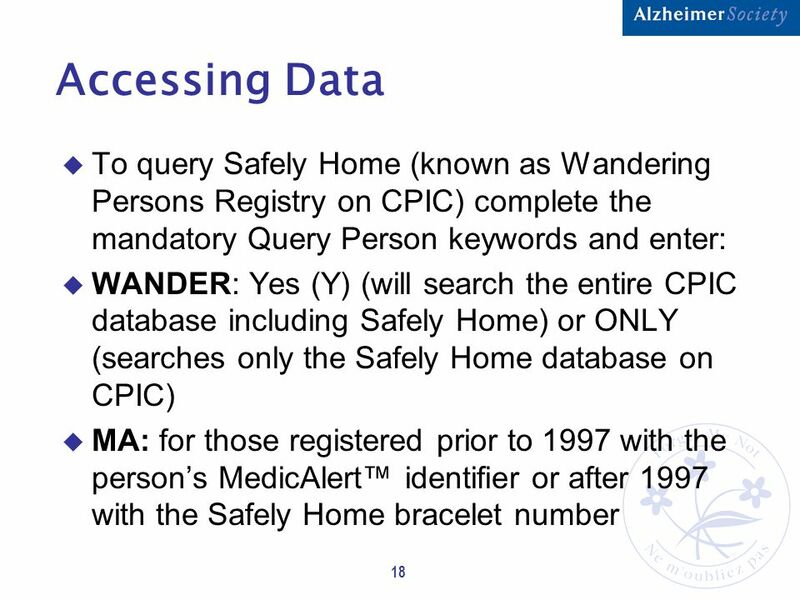 u the police will access CPIC to find pertinent information including: u personal history, physical characteristics and locations where the person is known to visit. 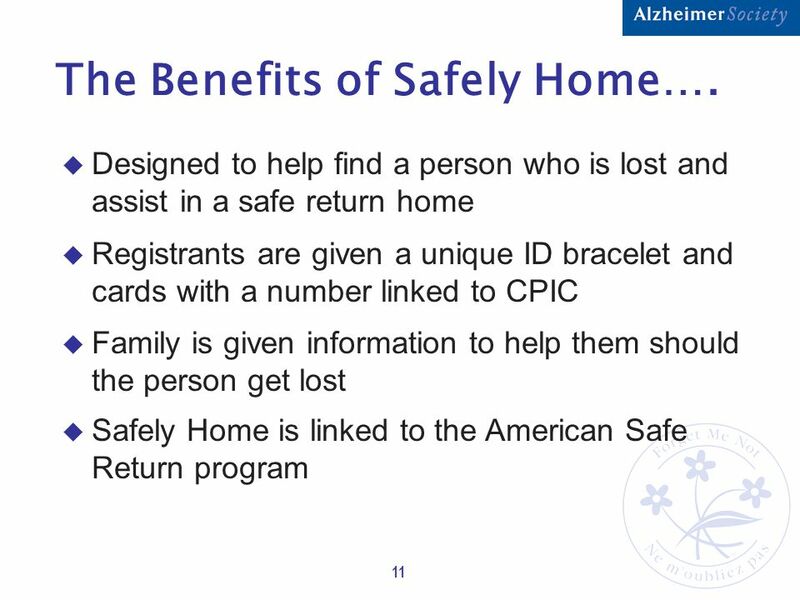 13 13 Safely Home...How Can It Help? 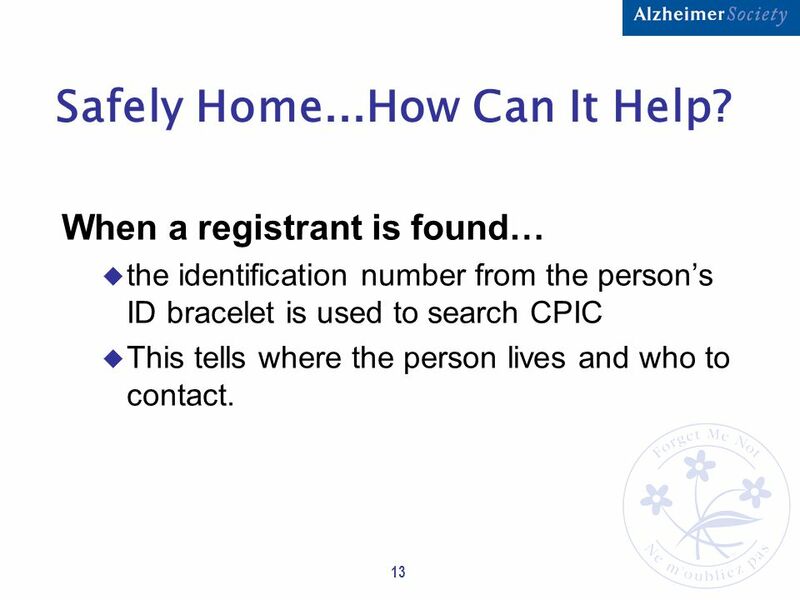 When a registrant is found… u the identification number from the person’s ID bracelet is used to search CPIC u This tells where the person lives and who to contact. 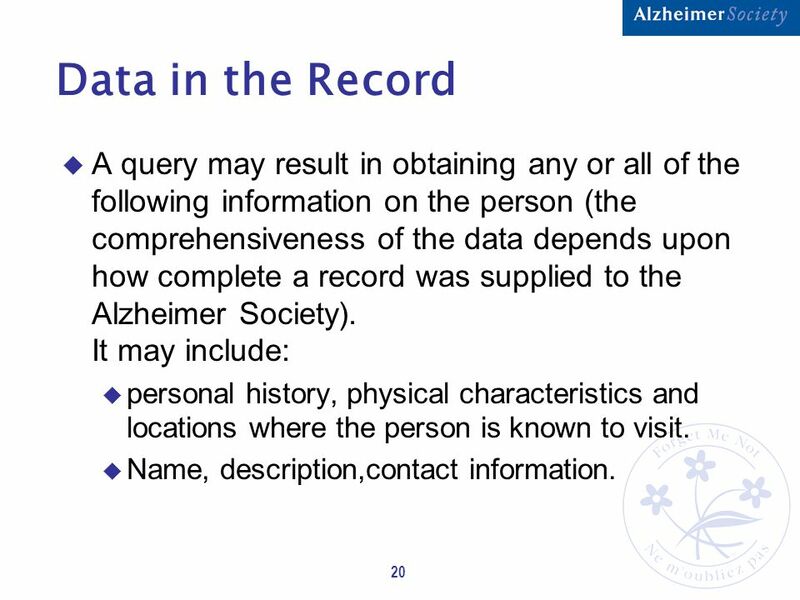 20 20 Data in the Record u A query may result in obtaining any or all of the following information on the person (the comprehensiveness of the data depends upon how complete a record was supplied to the Alzheimer Society). 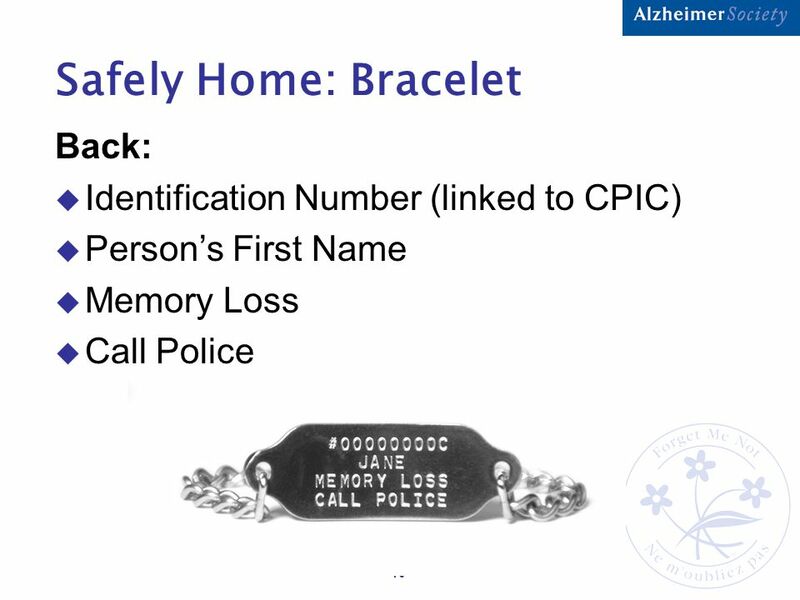 It may include: u personal history, physical characteristics and locations where the person is known to visit. u Name, description,contact information. 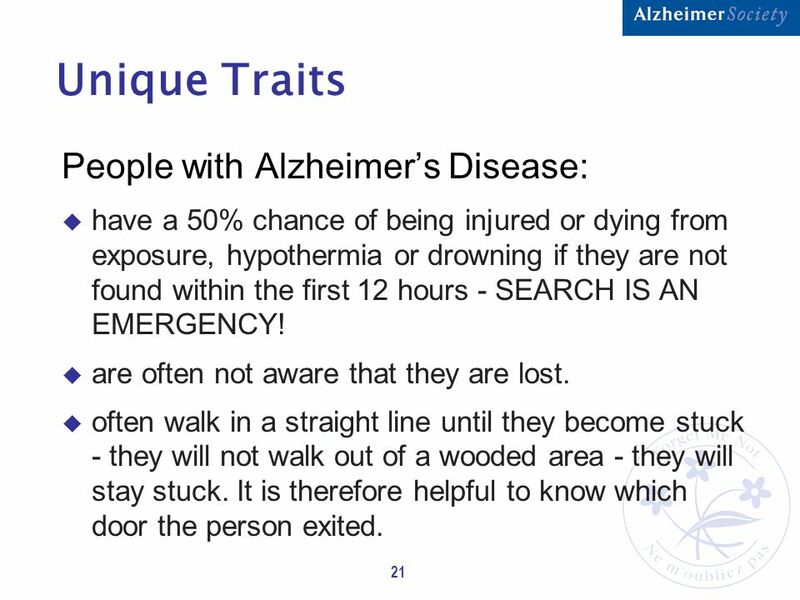 21 21 Unique Traits People with Alzheimer’s Disease: u have a 50% chance of being injured or dying from exposure, hypothermia or drowning if they are not found within the first 12 hours - SEARCH IS AN EMERGENCY! 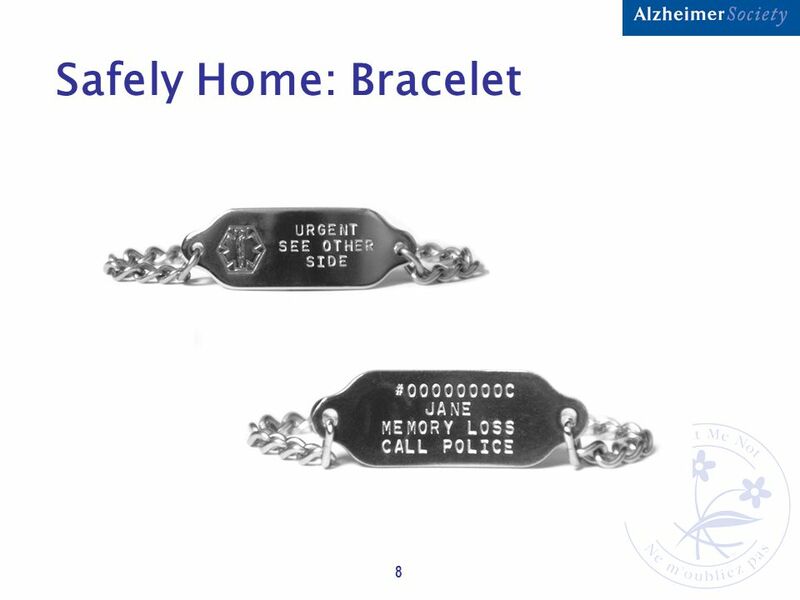 u are often not aware that they are lost. u often walk in a straight line until they become stuck - they will not walk out of a wooded area - they will stay stuck. It is therefore helpful to know which door the person exited. 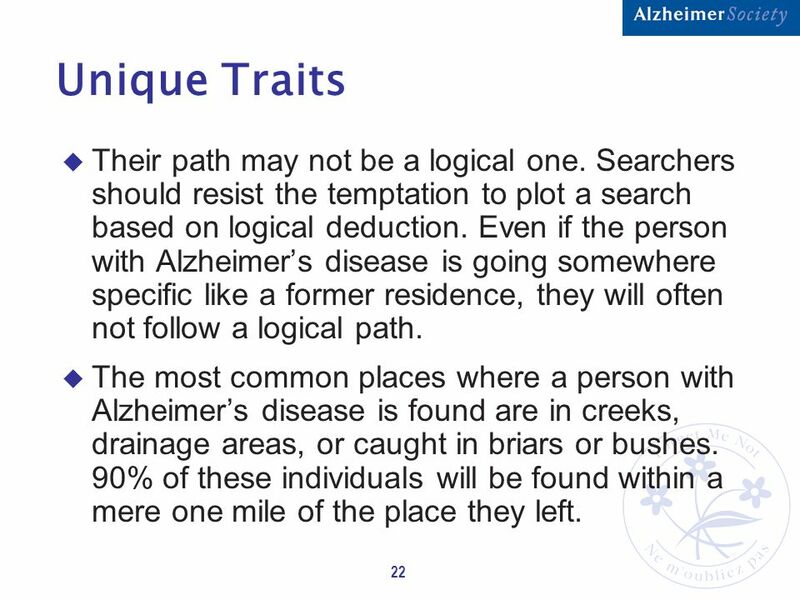 22 22 Unique Traits u Their path may not be a logical one. 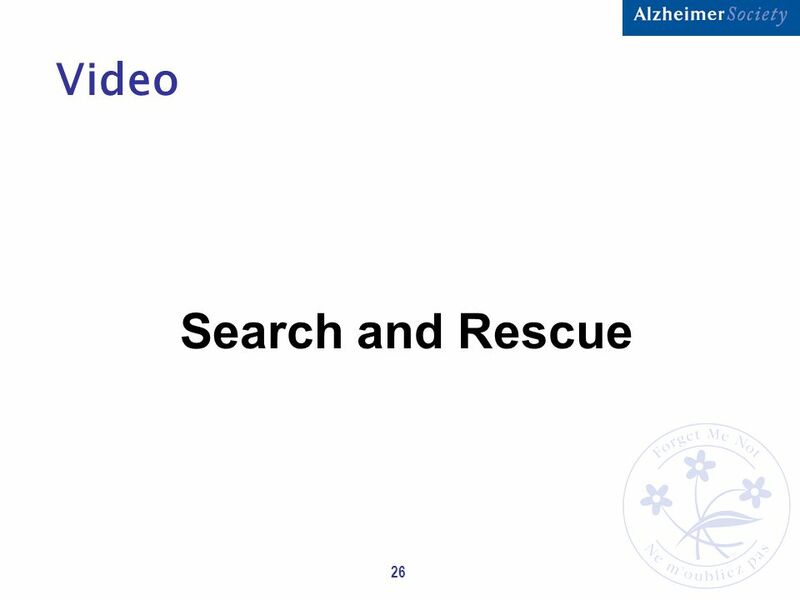 Searchers should resist the temptation to plot a search based on logical deduction. 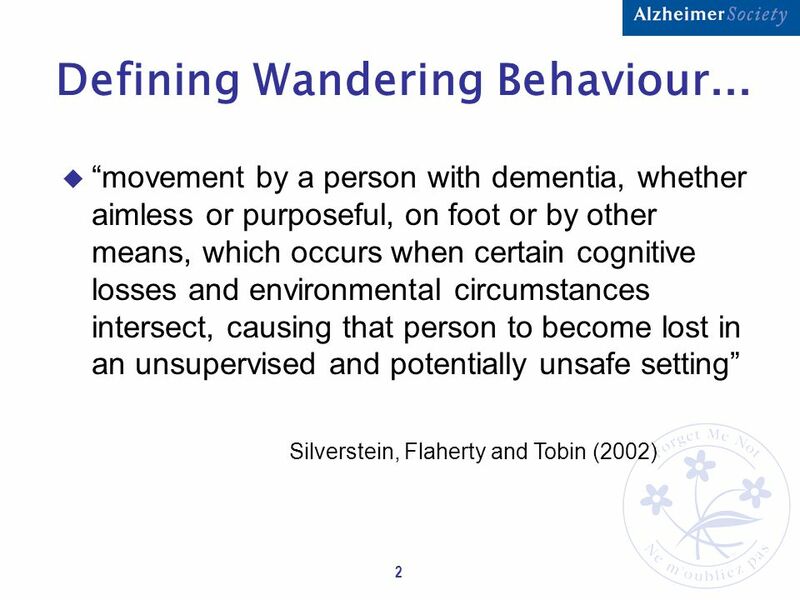 Even if the person with Alzheimer’s disease is going somewhere specific like a former residence, they will often not follow a logical path. 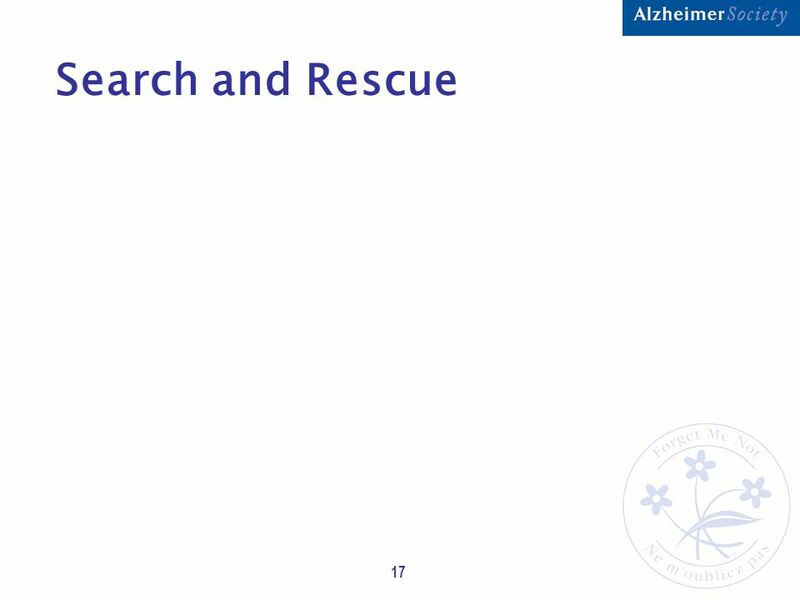 u The most common places where a person with Alzheimer’s disease is found are in creeks, drainage areas, or caught in briars or bushes. 90% of these individuals will be found within a mere one mile of the place they left. 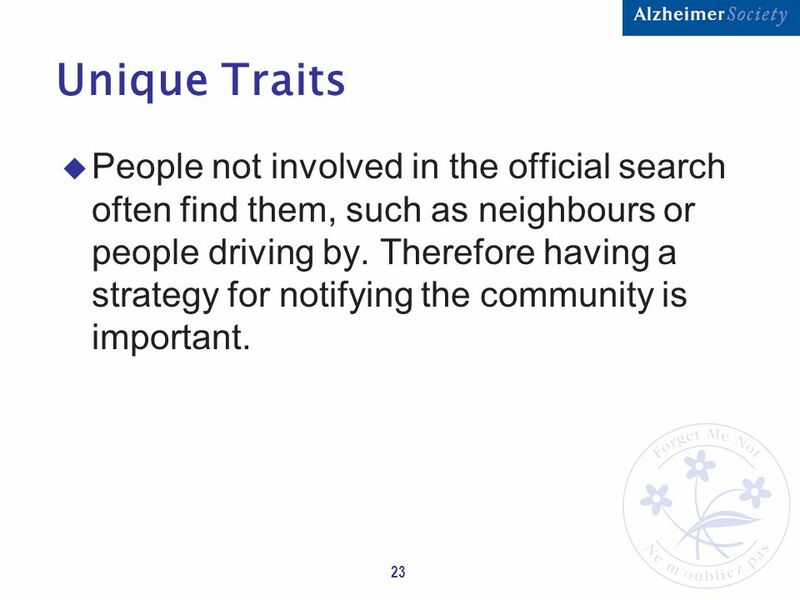 23 23 Unique Traits u People not involved in the official search often find them, such as neighbours or people driving by. Therefore having a strategy for notifying the community is important. 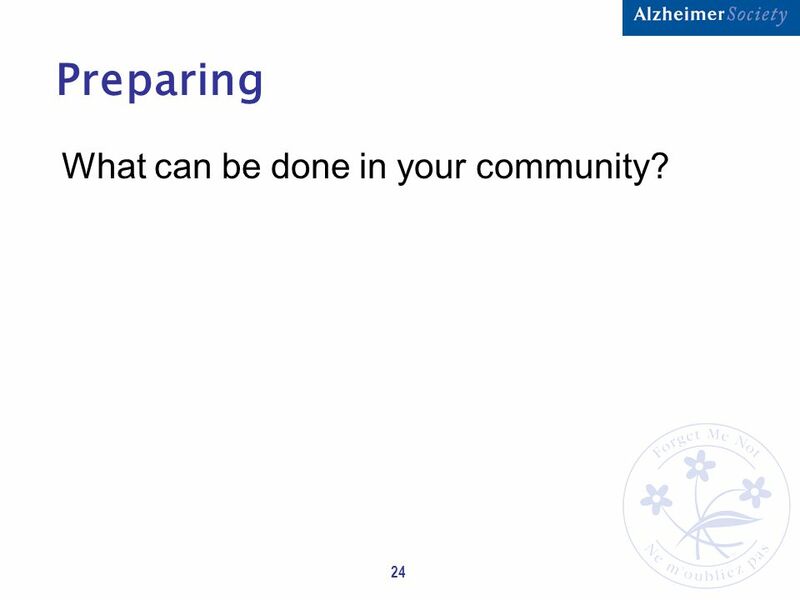 24 24 Preparing What can be done in your community? 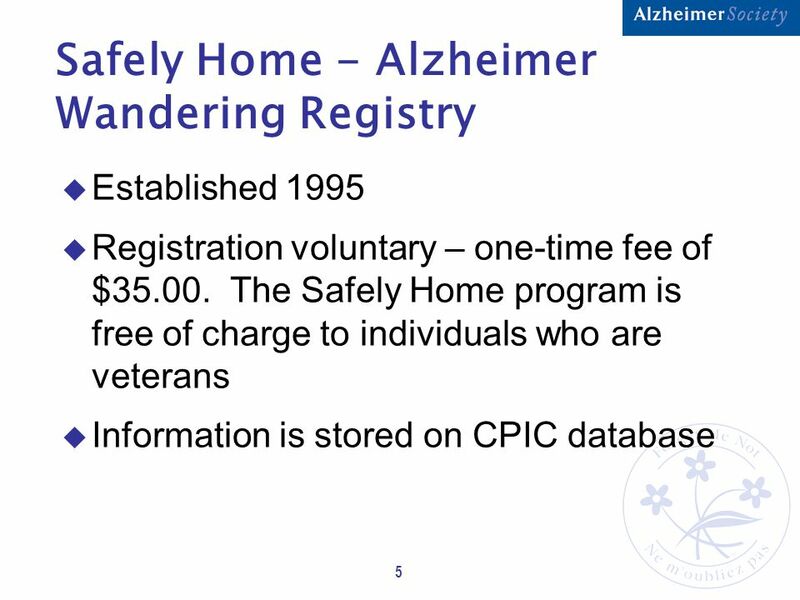 Download ppt "SAFELY HOME™ Alzheimer Wandering Registry Randy Antonio - Detective Constable, Missing Persons Unit Winnipeg Police Service Janice Hebb - Client Services." Plate with Vehicle Plate with Owner July Plate with Owner Applies to the Following Vehicles Commercial Vehicles Noncommercial Vehicles Trailers. 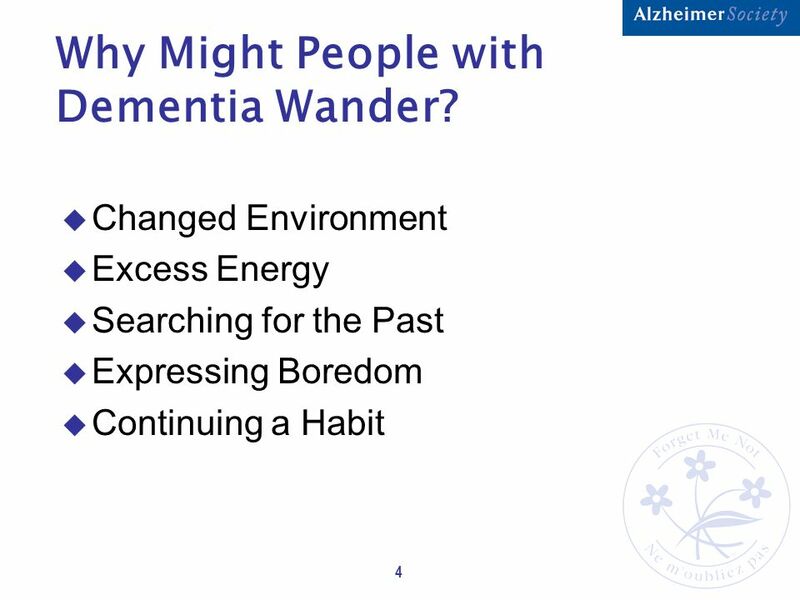 Alzheimer's Disease & Related Dementias: Training for Financial Professionals. HR Forum: Inclement Weather May 4, University continues certain operations during periods of inclement weather due to the needs of students, the. Michael Smith, Safety Manager. FIRE SAFETY The main object of the fire safety arrangements is to save life. The fire alarm procedure should be followed. 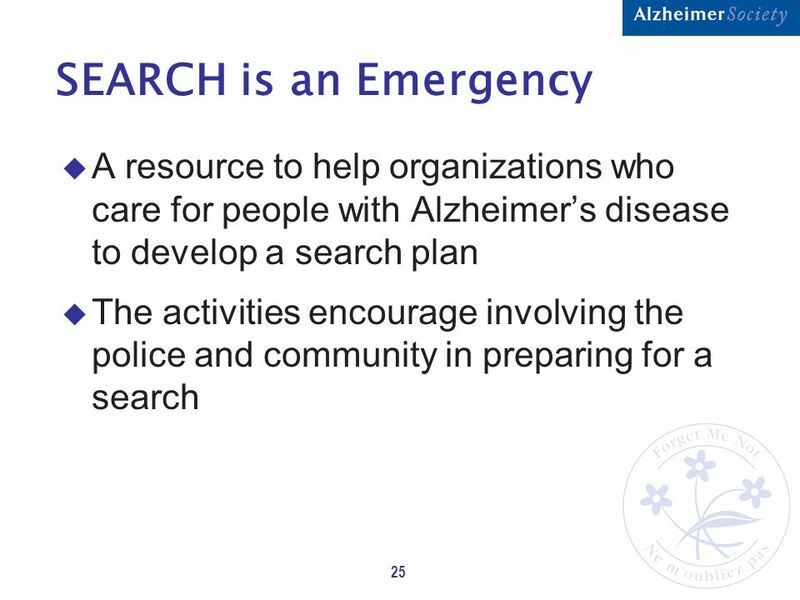 1 Search is an Emergency A Pre Plan for the Search and Rescue of Missing People with Alzheimer’s Disease and other Dementias Janice Hebb – Safely Home. Video Streaming and Online Classes Information and Instructions for Students University of Central Florida Regional Campuses. MASS RECRUITMENTS & RECRUITING AGREEMENTS Wagner-Peyser Program. 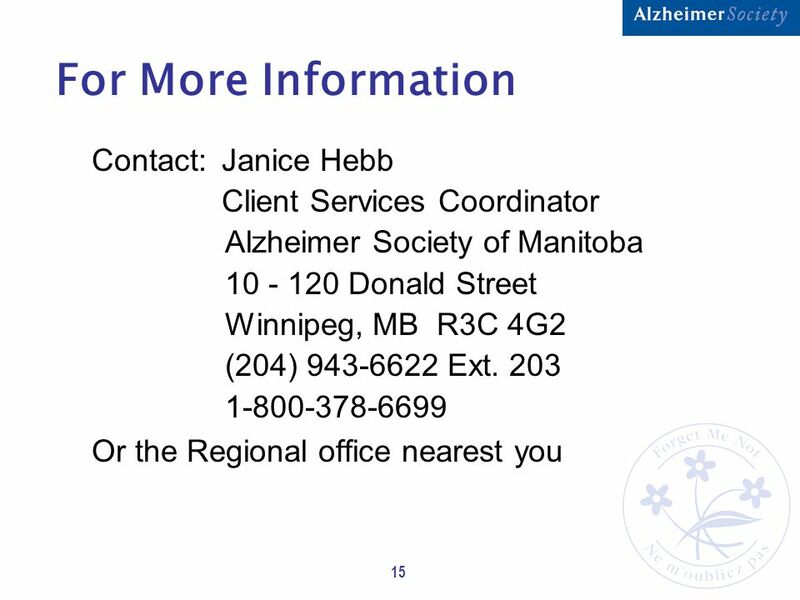 ACT on Alzheimer’s Disease Curriculum Module IV: Effective Interactions. 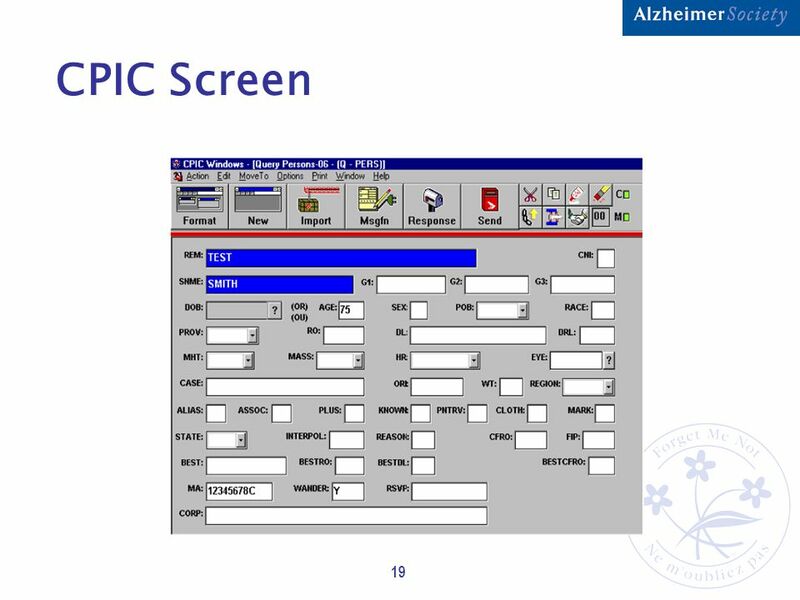 The first contact to make for answers related to aging or living with a disability. 1. 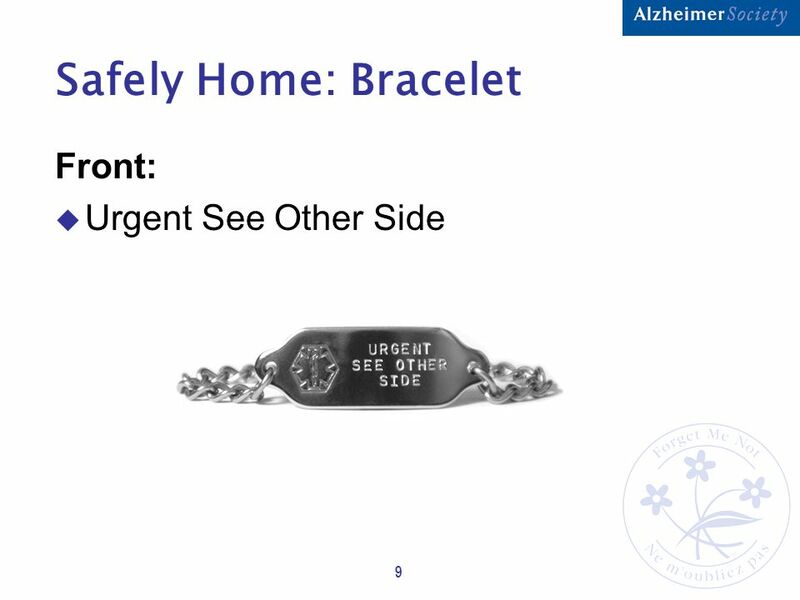 Presented by Barbara McKenzie, MA; Meredeth Rowe, PhD & Helen Moore, PhD. Online Instruction Information and Instructions for Students UCF Valencia West UCF Valencia Osceola. 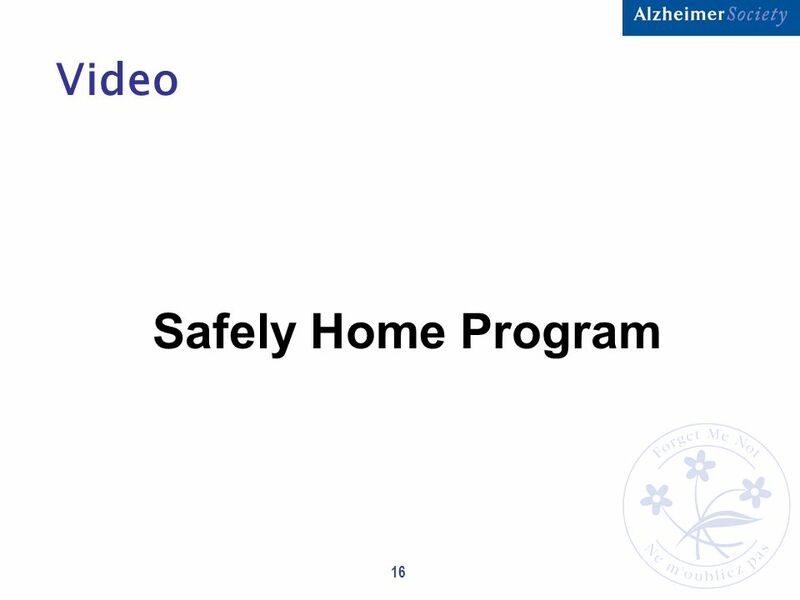 + STUDY ABROAD PREDEPARTURE MODULE HEALTH AND SAFETY Presented by: Study Abroad Office. By: Candice Carlson & Josh Edwards. What is Alzheimer’s? 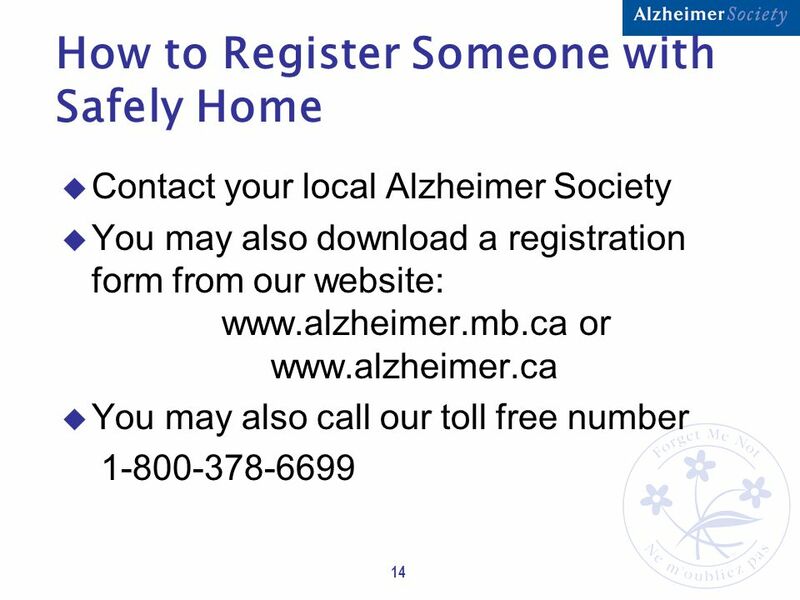 Alzheimer’s is a type of dementia Problems with memory, thinking, and behavior. Symptoms develop. Education Calendar Southern Colorado Region April - June 2016 Dementia Conversations This workshop offers tips on how to have honest and caring conversations.